What did we learn in the Genworth results? Australia’s largest mortgage insurer, Genworth (ASX: GMA) released its financial results for 1H17. The results highlight the continuing growth of loan delinquencies, particularly in WA and Queensland. Much has been written of late about the extraordinarily high level of household debt in Australia, and what this means for the Australian economy and various sectors in the equity market given the amplification of the impact on household spending that would be caused by any future economic shock. With mortgage rates having bottomed and now tracking up, a step-up in non-discretionary household outlays from higher utilities costs, and continued weak wages growth, the household budget is likely to experience growing pressure as we move through FY18. A material increase in stress would have implications for a broad range of companies in the Australian market, from retailers and consumer service companies, to banks and insurance companies. One of the canaries in the coal mine regarding household stress is Australia’s largest mortgage insurer, Genworth. As such, we keep a close eye on its results for signs of a material deterioration in the financial position of the household in Australia. In particular, we look at the trends in mortgage delinquencies and claims activity. 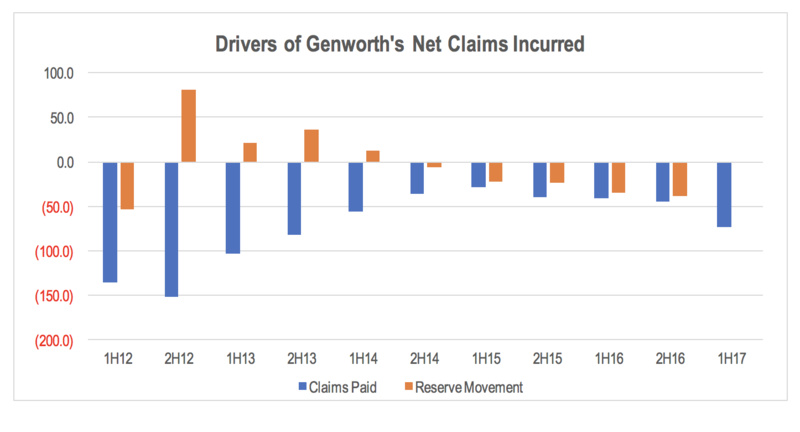 In its result for the six months to June 2017, Genworth reported a continued rise in both claims expense and delinquencies in its insurance portfolio. Looking at the claims expense line, claims paid jumped 77% relative to the same 6 month period in 2016 to A$72.7m. This was driven by a 26% increase in the number of claims paid and a 41% increase in the average size of each claim. While this rate of growth appears a to be more than a little concerning, it should be noted that the increase in the average claim size relates to delinquencies that occurred 12 to 18 months prior and appear to have been adequately covered by the reserve increases at the time. The main driver of the increase in claims paid came from mortgages in mining areas of WA and QLD. The second point is that while the percentage increase in claims paid is large, the absolute level of claims paid remains below that incurred in the 6 months to December 2013, and less than half the level paid in the 6 months to December 2012. So the growth rate largely reflects the low base of claims in the prior year. What is more concerning is the continuing growth of delinquencies. This is an indicator of future claims as well as household financial stress. The total number of delinquencies bottomed in December 2014 and has since increased by 50% as new delinquencies increased while ‘cures’ remained flat. 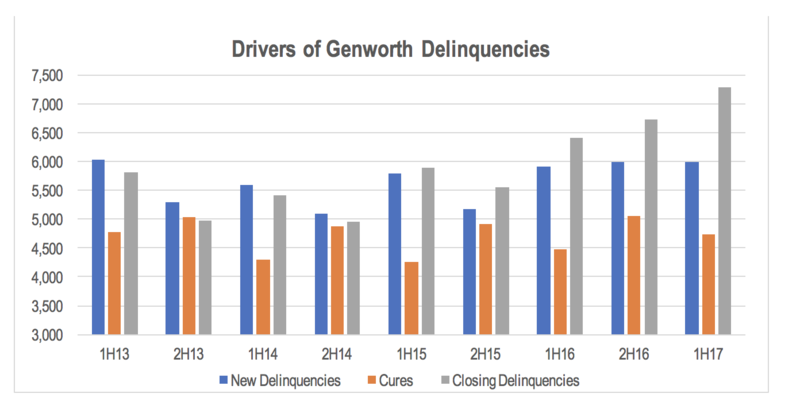 Genworth continues to point out that the delinquencies are primarily rising as a result of ongoing financial stress in areas of WA and QLD, which have seen significant increases in unemployment due to the mining downturn. But as the chart below also shows, there is a clear rising trend in delinquencies in VIC and early signs of a turn in NSW, albeit from a lower base and gradient than WA, QLD and SA. While the unemployment rate in Australia ticked down slightly in the 6 months to June 2017, Genworth remains concerned about the continuing elevated level of underemployment. The high level of underemployment implies that there remains excess labour capacity which means wage growth will remain weak. The company also noted the potential for recent mortgage book repricing by the major banks to put additional pressure on the serviceability of existing mortgages, resulting in increased levels of household financial stress. The company’s guidance implies a rising claims ratio in the second half of the calendar year, consistent with its expectations from 6 months ago. While the results in the 6 months to June broadly showed increases in delinquencies to varying degrees across all states, overall delinquencies remain reasonably low. Given the growing pressures on household budgets in FY18, we will continue to monitor these trends for signs of any acceleration in the rate of deterioration.